Danforth offers Air Duct Cleaning for commercial buildings in Western New York. According to the U.S. Department of Energy, up to 40% of energy used on heating and cooling is wasted. This is caused by the dirt, dust, and other particulates that build up over time in your duct system. These contaminants cause your HVAC system to work harder to achieve the same level of performance as a clean system, leading to higher energy bills and shorter equipment life. Cleaning your ducts not only affects your energy and operational costs, but also the quality of the air that occupies the building. Through everyday occupation in a building, we generate a number of contaminants from dander to chemicals. These contaminants are cycled through your HVAC system and re-circulated into the space roughly 5-7 times per day. Danforth is a proud member of the National Air Duct Cleaners Association (NADCA) and works in accordance with the Assessment, Cleaning & Restoration (ACR) Standard. This ensures that our skilled technicians are properly and safely performing HVAC inspection, service, and repair. Our Team is committed to continually improving their craft through yearly educational credits. NADCA only teams up with responsible and experienced companies that have the necessary experience and resources to provide high quality duct cleaning and service. Our partnership has flourished because of the synergy between NADCA’s policies and standards and Danforth’s experience and dedication to quality. Danforth’s insured, professional, and experienced service technicians have a systematic approach to cleaning you air ducts. We use high pressure air suction technology to rid your air ducts of contaminants making your building air healthier and boosting your HVAC systems efficiency. 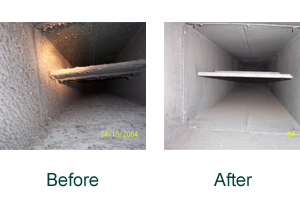 Start Your NADCA Duct Cleaning Project with Danforth. Meet with one of our NADCA Duct Cleaning consultants. We’ll outline our process and begin your project estimate. Fill out an Online Estimate and we’ll reach out to you with a NADCA Duct Cleaning proposal drafted to your exact specifications. Get answers about our NADCA Duct Cleaning services and speak with a knowledgeable NADCA Duct Cleaning Expert.